The history of the Chevette Convertible begins with a company called Baur. Baur Karosserie is a coachbuilder based in Stuttgart in Germany which has been building BMW convertibles since the 1930s. Currently Baur are the body and assembly works for IVM Automotive, a member the ED Group. In addition to producing convertibles they also undertake prototype work for many manufacturers including Porsche, Audi and Ford. In 1975 the Opel Kadett C was available in Saloon, Estate, Coupe and, in the same year, a 3 door Hatch. The Hatch was designed by Vauxhall and which Opel called the Kadett City. It was a comprehensive small car range but was missing one other body style – a convertible. Opel’s design department looked at a conventional style drop top based on the 2 door saloon and a prototype was produced but there was insufficient strength in the chassis without a huge and heavy amount of strengthening pushing the weight up too much. A second prototype was produced that was more of a targo-top design with a bar going across the middle of the car as part of the bodywork. Due to the low projected sales volume Opel, like many manufacturers, started looking around for a body builder who could produce the car in small volumes. 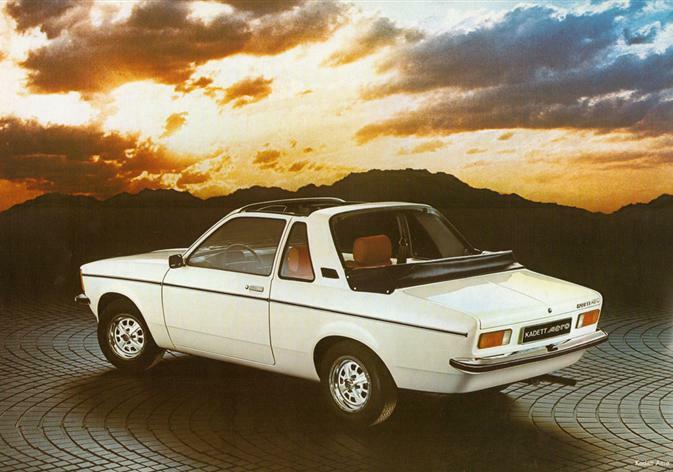 A deal was done with Baur who agreed to build it, they also made some modifications to the design to make it easier to produce.The car was called the Kadett Aero and first shown at the Geneva Motor Show in March 1976 and was included in the range for that year. The production version featured a targa-roll bar with a detachable roof insert and a fabric convertible section at the back, similar to the Lancia Beta Spider. 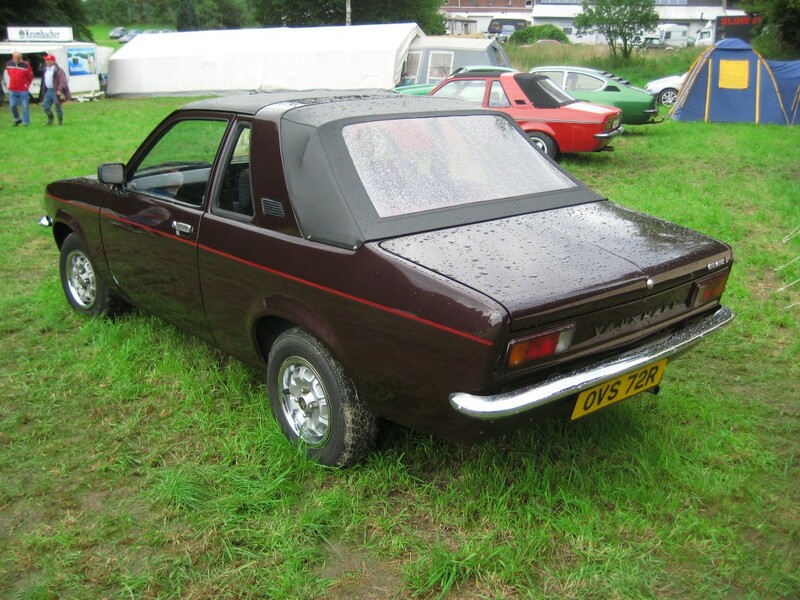 The removable centre roof section was a cumbersome process to remove and the sale price was much higher than any of the direct competition so the Kadett Aero struggled to find many buyers across Europe, it was never sold in the UK, and was withdrawn early in 1978 by which time only 1,242 had been produced. THE OPEL KADETT AERO WAS LAUNCHED IN 1976 AND WAS ALMOST IDENTICAL TO THE CHEVETTE CONVERTIBLE PROTOTYPES BEING CONVERTED BY THE SAME COMPANY. IT WAS NOT A SALES SUCCESS BUT IS HIGHLY COLLECTIBLE TODAY. 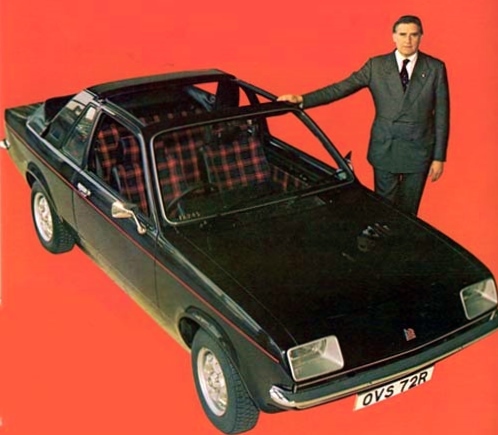 Bob Price, Vauxhall’s Managing Director, was in the process of rejuvenating Vauxhalls image and was always looking for products that would achieve this. 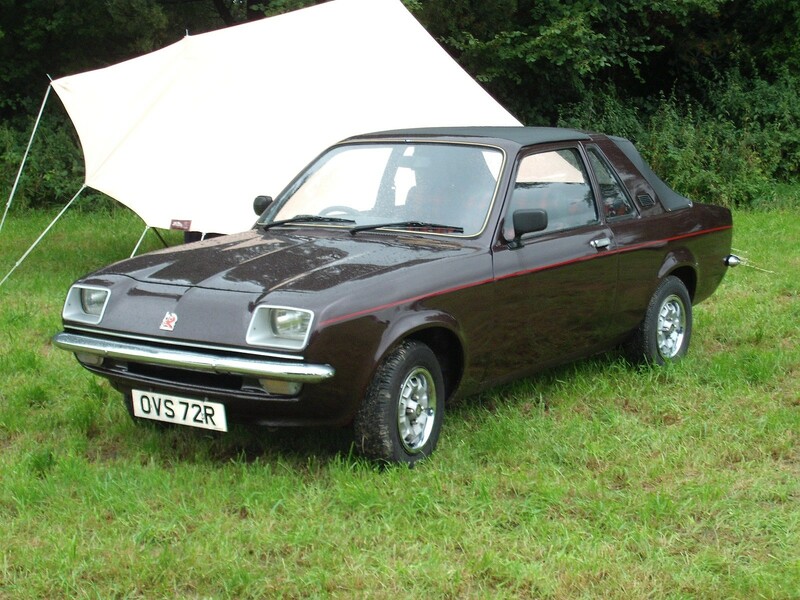 He had seen the Kadett Aero at the Geneva Motor Show, on his return he authorised Vauxhall's Design Department to send two Chevette L 2 door saloons, in Light Blue Metallic, to Baur to be converted in the same way as the Kadett. 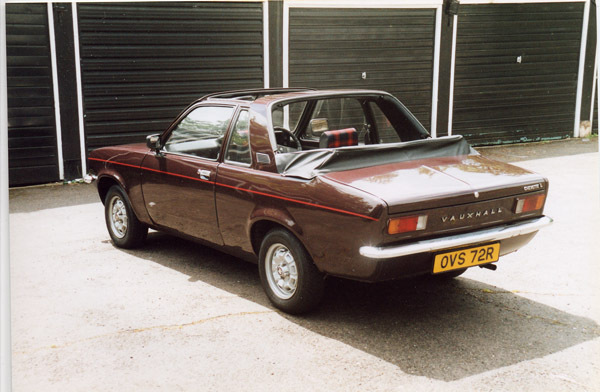 When the cars were returned to the UK they were stripped out and sprayed in Extra Dark Wine, a colour only used on the top of the range VX2300GLS and the very limited run of Vauxhall 2300 Sportshatch. The design department then kitted out the interior with unique bold dark red & blue tartan upholstery and bright red carpeting along with alloy wheels and side striping. It was evaluated by Vauxhalls product planning committee but they came to the same conclusion that Opel were actually experiencing – the car would be too expensive to sell in any meaningful numbers and the so project was cancelled. Surprisingly, Vauxhall never publically showed the car at any Motor Shows but it did feature in a Vauxhall supplement in Motor magazine in March 1977 with Bob Price posing next to it (see picture) It was this car that was registered and used on the road, the other was broken up for another project by the design department. It is now owned by an enthusiast in Germany and is being restored to its original condition. 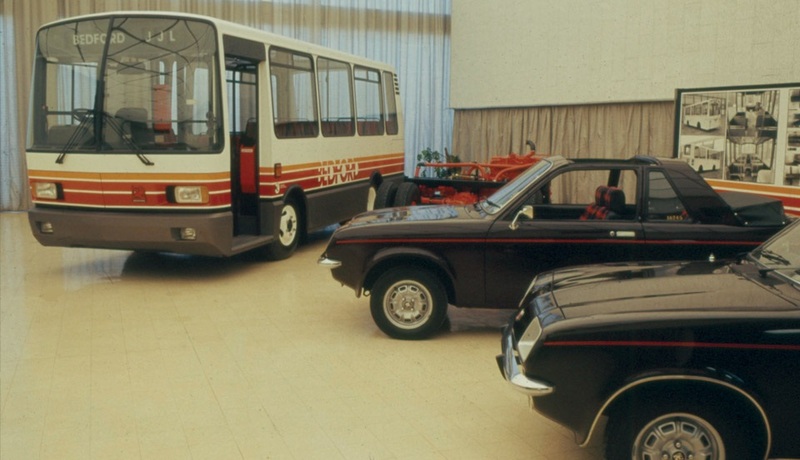 THE TWO NEWLY CONVERTED CHEVETTE CONVERTIBLES IN THE LUTON DESIGN STUDIO FOR EVALUATION BY THE PRODUCT POLICY COMMITTEE, THEY CAME TO THE CONCLUSION, BASED ON OPELS LACK OF SUCCESS, NOT TO GIVE THE GO AHEAD FOR PRODUCTION. IN THE BACKGROUND IS A BEDFORD JJL MIDIBUS AND ON THE FLOOR A BEDFORD 500 DIESEL ENGINE.